Keiritas Yoga on Phi Phi Island offers Yoga predominantly Hatha and Ashtanga styles, for small groups and on a one to one basis.Yoga is the disciplining of the body, mind and emotions and should be approached with concentration and awareness. Breathing is vital in yoga, the inhalation expands, lengthens and helps upward movement. Keiritas Yoga is used to lift out of a posture. The exhalation releases tension and helps downward movement. It is used to relax into a posture. . Practiced for over 4000 years in India as a wonderful complimentary tool for life, it’s value and popularity has spread around the world. Here on Phi Phi island we are lucky not only to have an experienced teacher Keira who teaches in the Hatha and Ashtanga styles but also some of the world’s finest views to awe and inspire your during your outdoor practice. The classes are held on the open roof top of Carlito's beach bar where Tonsai Bay merges with the famous Phi Phi Don Cliffs and Tonsai Towers which bring a sense of calm to the proceedings. Keirita's Yoga has sunset classes 6 days a week Saturday through Thursdays though private classes maybe requested on any day. The public classes are all 90minutes, from 5.30pm to 7:30pm to take in the best of the sunset but also allow you time to explore the island during the day. One to one tuition happens in the mornings at the Narada massage studio located at the Phi Phi View Point Resort overlooking the pretty Loh Dalum Bay. Many students combine the yoga classes with diving, The practice of slow smooth and rhythmic breathing is most beneficial in improving ones air consumption underwater. Also by moving and breathing in a slow and controlled manner can make diving a very meditative experience. Yoga is also complementary for any rock climbers, another important activity on Phi Phi Island! Climbing requires a sense of balance, flexibility and the ability to feel movement. It also requires energy control, and muscle power. Climbers find the strength and concentration gained from regular yoga practice of great benefit. Many practice yoga on holidays in retreats cut off from over stimulation. However if your new to yoga and want something that fits at little more openly with the rest of your vacation then taking yoga on Phi Phi maybe just what you need. 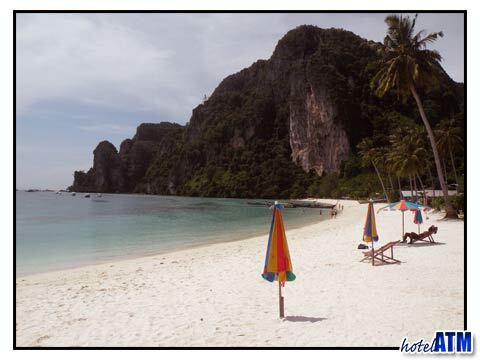 There is so much to do and see on Phi Phi Island and yoga is complementary to all of it. Anyone can benefit from yoga. Initially you may be stiff and wonder how you will ever manage a forward bend. The answer is you must only do as much as your body allows. In quite a short time and with regular practice you will find yourself becoming more supple. Things you found impossible in your first class come more within your grasp. The postures not only work to tone and reshape the outside of the body, they work on the endocrine system also stimulating the internal organs and revitalizing the nervous system. The prices for the lessons are tailored to those who wish to practice over a few days, so that the daily fee reduces from 500 THB on the first day to 200THB by the 4 day. Likewise one to one tuition starts at 1,500 THB for one day and comes down to 1,000 by the sixth day. All classes require that you arrive punctually, wear loose comfortable clothes that allow you to stretch easily. We also ask that you arrive to class clean as a courtesy to your teacher and fellow students. It's also recommended that you to bring mosquito repellent if you are prone to bites. Welcome to Keiritas yoga on Phi Phi island. Keira draws from a complimentary mix of varying yoga styles which are predominantly Hatha and Ashtanga based depending on class level. All classes are small and personal with ten or less per group. Private classes are also available on request.